Recently, Imran and I watched Antman, the movie based on a Marvel Comic character with self-explanatory title. I’m not usually one for sci-fi, but anything starring Paul Rudd is Oscar worthy in my unbiased opinion. Whilst watching Mr Rudd, I turned to Imran and saw him in a new light as I couldn’t help but draw on the similarities of everyday dentistry and everyday superheroism. Let me present to you the evidence…..
Just as Spider Man has a Spidey Sense, we have our X-rays and clinical know-how to predict future catastrophic events, and just like Super Man, we can usually treat you quickly and stop things (like your face) blowing up. Marvel’s heroes arrive in capes and disguises. We arrive in masks and goggles. It’s basically the same thing. Move aside Batman, with your fancy gadgets to help protect Gotham City. Imran and I have an electronic chair to aid your comfort, magic magnifying glasses to see every detail, and even a machine that beeps manically when we measure your root canal. London City, you are clearly safe in our hands. Super Man has freezing powers, we have ethyl chloride. The Human Torch has flames, we have a Bunsen Burner. Captain America has his shield, we wear face shields. I could go on, but I’ll leave the rest to your imaginations. I am definitely convinced of our newly established superhero status’. The longer I look at Imran, the more he looks like Paul Rudd. 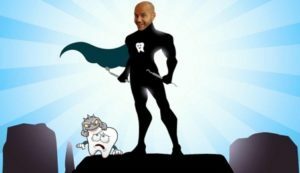 If you are looking for a superhero to look after your smile, call the fantastic team on 0203 0801000 or book online here. Stay classy London (because Ron Burgundy is definitely a superhero).